The British Gazette » The 3 “F’s”: Fact, Fiction & Fantasy. Forty two years ago, a twenty year old young man walked into a bookshop and purchased three books for the princely sum of £1.20. They were 40 pence each. It was 1975. 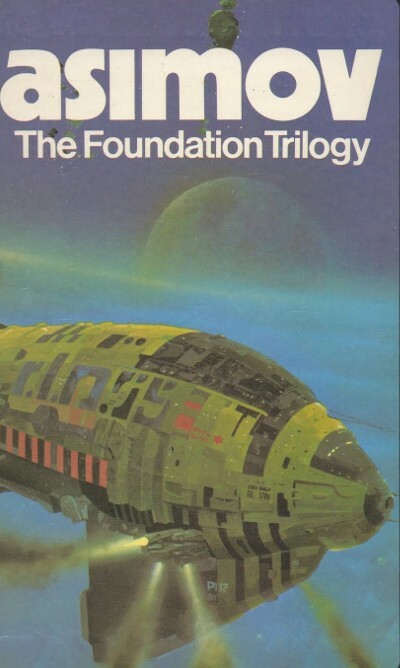 These were the Foundation Triology by science fiction author Isaac Assimov. It was the year that 10cc’s song, “I’m Not in Love” was in the charts and Tony Blackburn was a DJ on Radio One. Four years earlier (before 15th February 1971) the books would have been 8/- and all three would have set him back £1/4/0. It is also a FACT that many of those reading this article will have no idea what the symbols “8/-” and “£1/4/0” mean. I was that young man and many years after I had purchased those three books (which by that time had been consigned to a cardboard box in the loft) I had occasion to visit the Beamish industrial museum in County Durham. I was standing outside a reconstruction of a draper’s shop and in the shop window were various cloths all with price labels on. One label showed the cloth priced at 1/- a yard. A lady and a small child walked up alongside me and the child said, “One slash dash. What is that?” The lady replied. “I don’t know. I’ll see if it says anything in the guide book.” The guide book did not and I enlightened the lady as to what “One slash dash” meant. I also had to explain what a “yard” was. This goes to show how the world has changed, is changing and will continue to change. It happens because life happens. We are born, we grow up, we grow old and then we die. It is inexorable. The change is gradual but like the waves eroding rock, unstoppable. On Friday 17th February there will be a big UKIP rally held in the Premier Suite at the Macron Stadium in Horwich, Bolton. UKIP call it the “UKIP 2017 National Spring Conference”. It is of course nothing of the sort. It is a party rally. A conference is an event where there is a discussion or series of discussions takes/take place and decisions may be made. The so-called conference is a rally because Mr Paul Nuttal, UKIP leader and candidate in the Stoke Central by-election will be accompanied by former leader Nigel Farage both of whom will take the opportunity to make encouraging speeches. They will be loudly applauded by the audience and each man is guaranteed to receive a standing ovation. And so they should! That is the point of a party rally! That a party rally will take place on the 17th of this month in Horwich is a fact. That it is a conference is fiction. The policy Mr Nuttal will be seeking to encourage Madam May to adopt in the forthcoming Brexit negotiations is fantasy! Mr Nuttal’s proposals are fantasy because the sovereign entity that is the European Union of the Cities and the Regions (to give it it’s full title) is an extraordinarily complex entity whose complexity is compounded many fold by it’s membership of another complex entity, the European Economic Area. Up to now, the British Gazette has itself been like Nellie [played by Mizzi Gaynor] in the 1958 musical “South Pacific” and has remained “a cockeyed optimist”. The British Gazette is still hopeful that as stated in our recent article (http://www.british-gazette.co.uk/2017/01/28/todays-mantra-to-be-recited-antiphonally-history-repeats-itself-but-in-different-ways/) Madam May is playing a game of political “musical chairs” in which the lady seeks to ensure that it is Labour, the Lib-Dems and the SNP who force her into maintaining the UK’s membership of the EEA by an amendment to that effect in the European Union (Notice of Withdrawal) Act before it receives the Royal Assent. IF the opposition parties succeed in forcing an amendment to require “Her Majesty’s Government” to negotiate the UK’s withdrawal from the EU but to re-enter the European Economic Area (we cannot maintain membership of the EEA because the UK is a member of the EEA by dint of it’s EU membership) then the UK is not “out of the woods” but is far less likely to end up going over a cliff when it is “out of the EU wood”. There is still a slight risk that things could go disastrously wrong but the risk is slight if the UK starts off from the outset in pursuit of what is commonly known as “the Norway Option”. IF the opposition parties are successful, they will have secured the continued economic security of the UK but at a huge price – for them. This is because the EFTA+EEA deal arrived at will be roundly condemned by the back bench Tory MP’s demanding “Hard Brexit”. They will lament the billions the UK will end up paying in RAL payments (unavoidable) and the continuing payment to remain a member of the Single Market aka the internal market. Those MPs who will suffer the most are the Labour MPs in what once were the Northern Heartlands. This is because many formerly Labour voters will switch their support to UKIP, who under the leadership of Paul Nuttal will if he has any political sense (and he appears to have this) set UKIP’s stall out to capture Labour votes. 1. Call Brexit off. Announce to Parliament, the EU and the world that “Brexit no longer means Brexit”. The costs of this are clear. Economically, very little. Politically, catastrophic – for her and the Tories. Absolutely fantastic for UKIP. 2. Pursue the negotiating strategy she has announced and along the lines Paul Nuttal would recommend. The costs of this are clear: Up to or near the point of withdrawal: Politically and economically OK for her. After Brexit: Catastrophic both politically and economically. 3. Negotiate withdrawal from the EU, re-entry into EFTA to enable an immediate exit and re-entry into the EEA upon Brexit. The costs of this are clear: Economically in the short term, not too bad. Politically in the short term, very bad as Tory divisions on UKIP will be opened up and UKIP will be the great beneficiary. Some Tories might even cross the floor to become UKIP. Worryingly however, there is steadily mounting evidence indicating that Madam May is not playing musical chairs and manoeuvring her herself and her party into the least worst (the phrase “next best” is not applicable in the light of the possible downside) position. It is possible that we might have arrived at the “complexity point” – a situation that the Galactic Empire had reached in Assimov’s “Foundation.” The Galactic Empire had grown so large and had become so complex it was unmanageable. The Empire had become so vast that it was run on the basis of billions of different parts governed by rigid specialisation and compartmentalisation – with no one person or group having knowledge of how the other parts functioned. In other words, in reality, the EU has grown so complex and the UK competence at self government has withered to such a degree as to have rendered the politicians and civil servants in HMG incapable of proper and realistic decision making. In other words, they think that what Paul Nuttal will say at Macron Stadium on Friday 17th February 2017 will make sense! IF that is the case then the country is [expletive deleted]!